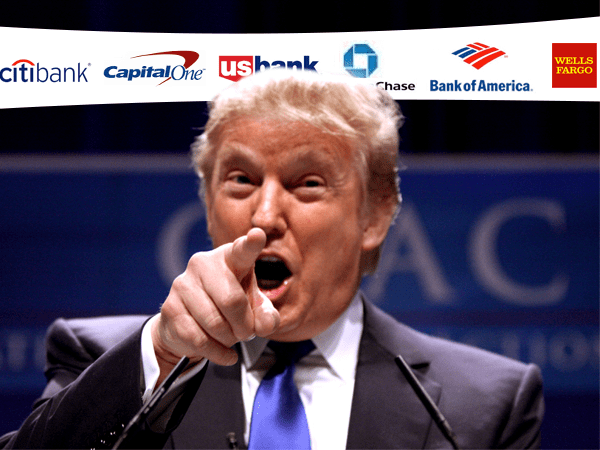 Donald Trump caused a stir on Monday when he said he’s considering a breakup of Wall Street’s biggest banks. Assuming Trump is serious about this, and assuming he succeeds in breaking up the big banks, it would drastically change the financial landscape in America. With that in mind, it’s important that you know how the change could affect your savings strategy. On the campaign trail, Trump promised numerous times to reexamine Wall Street regulations. Now it looks like he’s attempting to make good on that promise. Significant deregulation by dismantling the notorious Dodd-Frank legislation passed under Obama is already on the table. But a new regulation could be around the corner too. Well, the Glass-Steagall Act was passed in 1933, and it prohibited banks from combining their commercial and consumer operations. As a result, it kept banks smaller and prevented them from gambling the financial security of average Americans on their commercial investments. But Glass-Steagall was repealed in the late 1990s. Can you guess what happened? It led to the emergence of the massive mega banks that landed us in our last financial collapse. Banks were allowed to become “too big to fail.” By letting them put commercial investments in the same bucket as consumer investments, they became ticking time bombs. That’s why the government was forced to bail them out. Americans’ savings were held hostage. Without the bail out, these megabanks would’ve taken down consumer investments along with their bad commercial investments. With this stated intention to reinstate Glass-Steagall, Trump’s message to big banks is that he won’t let that happen again. But how will that impact average Americans? Is it all good news? It’s a mixed bag for the financial sector. On the one hand, Trump wants to drop regulations by scrapping Dodd-Frank. On the other hand, he could put the squeeze on big banks by bringing back a new incarnation of Glass-Steagall. At first, it seems like there’s no way this could be bad for Americans. Rolling back Dodd-Frank could stimulate growth, and beefing up banking regulation should keep Americans safe. Removing the regulations provided by Dodd-Frank could make it easier for Wall Street to start playing with fire again. And bringing back some form of Glass-Steagall could be Trump’s way of saying he won’t stand for another bailout when things go south next time. They say that the road to hell is paved with good intentions. Trump’s heart might be in the right place, but these policy changes could be setting us up for yet another crash. And if the government does nothing for banks during the next crash — as Trump’s comments imply — it could be far more damaging than 2007-08. During that last crash, when the government did intervene, gold and silver continued to climb higher. What if the government doesn’t intervene next time? Things could be even worse for the markets, and even better for gold. If you don’t already have some of your savings in precious metals, years from now, hindsight may ultimately prove this a great time to do so.